Here is an essay version of my class notes from Class 7 of Stanford University’s CS183C — Technology-enabled Blitzscaling — taught by Reid Hoffman, John Lilly, Chris Yeh, and Allen Blue. Errors and omissions are my own. Credit for good stuff is Reid, John, Chris Yeh, and Allen’s entirely. 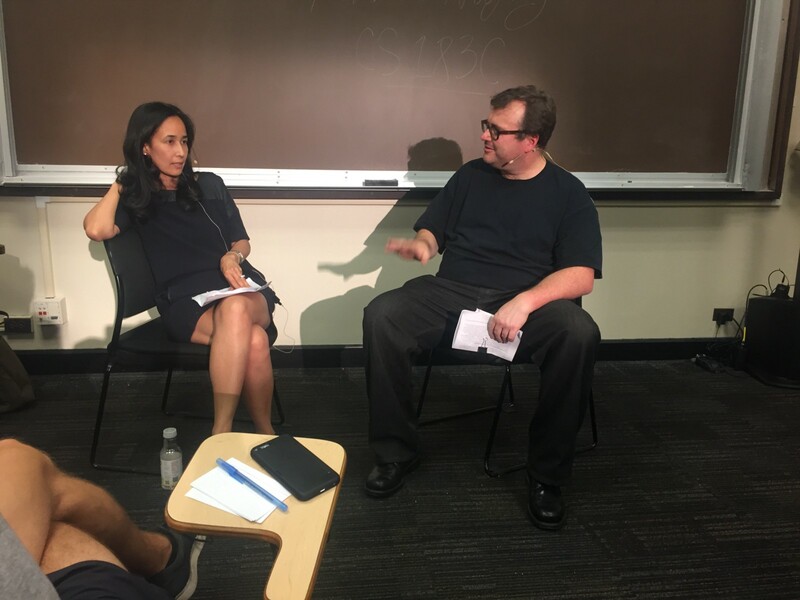 This class was an interview by Reid Hoffman, of Mariam Naficy— the founder and CEO of Minted — on lessons learned from scaling her first and second startup (Eve). The below is my paraphrasing of their conversation. To recap, we are now on the Tribe Stage of scale — where organizations with product market fit begin to scale in operations. Reid Hoffman: Let’s talk about your first startup, Eve — how did you start it? How many employees did you get up to? What were the lessons learned? Mariam Naficy: We started right here, I was in the basement of the Stanford GSB on a payphone (yes a payphone) calling my best friend. This was in 1998 and the startup/funding environment was booming here and we realized it would take forever to progress through the ranks of banking and consulting so we wanted to start a business together. My best friend left her job at McKinsey and moved onto my couch, but her one condition was she wanted to work on her startup idea — an online cosmetic store. 1998 was a very different time in Silicon Valley. We started the company Eve, raised $26M in the first year — I was 28 at the time — and we built the company very fast. At the time it was a land grab mentality, we wanted to win mindshare for the first online cosmetic destination site. Looking back on it Eve was a simple business. We partnered with brands to stock their products, built a warehouse, had a pick and pack operation, and build a destination site for people to buy cosmetics. In 6 months we built the company to 120 people, built out a full executive team, had a fancy office on market street in SF, and a 10 person board. Pre-launch, Sephora approached us to buy us (crazy times) because they wanted to launch the online Sephora store in the US. We didn’t want to sell that early because we wanted to launch the business ourselves, so we launched, and a couple months later Sephora tried to acquire us again. 9 months into the launch we were raising our Series-D financing and we noticed that it was starting to get harder to raise money — this was in 2000. Sephora approached to buy us again and this time we took it seriously. They offered to buy us for $88M (in cash) and we were going to take it but one of our board members stepped in to make a competing offer — IdeaLab offered to buy us for $100M in cash. 2 weeks after this, the NASDAQ crashed and the bubble started to burst. It was a really stressful time because the acquisition hadn’t been approved yet, but luckily the deal stuck together. I stayed on with IdeaLab, we merged a few companies into Eve, and we ended up selling the whole company eventually to Sephora in 2000. These were crazy times. Reid Hoffman: If you were to call yourself during this time period, what are the key things you would tell yourself? Mariam Naficy: I would tell myself to think longer term. If I had to do it all over again I would have bought Eve back from IdeaLab once the market fell apart at 1/10 the price. Within the first year of launch we were doing 2M uniques and were on track for a $10M/yr revenue run rate. However when you are young and faced with the “great depression” (at least in the tech world) you have a tendency to become more conservative. In hindsight the internet was not over and it wasn’t time to leave town. It was really hard to have historical context during that time. Reid Hoffman: In fact it was 2–4 years of winter for Silicon Valley starting in 2000 — buying back Eve would have been a bold choice. Mariam Naficy: With the price of the acquisition I was able to pay off all of my personal debts, it was a big triumph in my life. However the downside is I have become much more conservative. It’s a lot of what-ifs but I am trying to be less conservative. Reid Hoffman: What about other lessons from Eve — around financing, hiring, operations? Mariam Naficy: I didn’t like the size of our board being so large in the beginning (10 people). With a board that size there were constant disagreements, fighting with one another, and we spent 20% of our time managing our board. We needed to work harder on our operations — not managing our board. If I had to do it over again I would have had a much smaller board. Secondly I would have backed away from heavy VC financing so early. The upside was I got to see what capital buys you — the best PR, the best head hunters, the best execs, and I was lucky to learn on other people’s dime. Now since starting my second company — Minted — we raised $11M to operate for 7 years to get to our break even point. Now that we know how to scale we just raised $90M to scale the company and bring on a full executive team. Reid Hoffman: One of the key themes of the course is choosing when to blitzscale. It’s not that success = blitzscale / not success = not blitzscale. The decision when to step down on the gas pedal is the key decision. Why did you decide to stay capital efficient for 7 years and why was the time to scale now? Mariam Naficy: When I had started Minited, I just had my second child and I wanted to be able to control the pace of my company. My first startup Eve bought me a lot of credibility and a lot of career choices — I was able to afford a family and a career. Secondly, I wanted to be able to have the flexibility to completely changing our model based on the things we learned as we built it. It’s much harder to completely change when you have 10 person working on a product line vs. 1 person. For example, with our initial angels, they weren’t on board with our crowdsourcing strategy — they wanted us to sign up all of these brands and build distribution rights with existing brands. No one at the time was talking about crowdsourcing — we weren’t in the land grab mentality. With Eve, we had 5 direct competitors who launched 1 month right after we launched and we were spending great sums of money to become the online cosmetic destination site. With Minted — no competitors were circling — so we could take our time. Reid Hoffman: What was your idea for starting? Given your background I am assuming you didn’t want to run a lifestyle business — how did you know you were going to run this for awhile and it would become big? What was the hypothesis for when you would ramp? Mariam Naficy: I have always been a lifelong shopper, even as a kid I was always in the mall. One thing I noticed at the mall was with all retailers — this brand was hot, then the brand wasn’t hot, and all retailers had a couple bad years. I wanted to build a retail brand which would be fresh forever — I wanted to completely remove the risk of a couple people choosing all of the merchandise. Our key hypothesis was — if you could turn all of the decisions over to the crowd (let the crowd submit and curate styles) — your retailer would stay fresh forever. Our first initial target was to start our crowdsourcing model within the stationery market. Our angels joked that we were bringing a “gun to a knife fight” aka bringing our “disruptive power to the stationery market.” We did this because I wanted to start the business in a small market, with small competition, take over the market completely, and go after a high margin product. Stationery also had the secondary benefit of inherent virality, a big repeat factor of usage, very loyal customers, and who were open to upsells. It was only until 2011/2012 we realized we weren’t a stationery business at all — the community was much bigger and broader than just stationery. Reid Hoffman:— What was the theory of how you wanted to apply your scale capital? Mariam Naficy: We could no longer afford to run on a shoestring budget. We needed to build out an exec team to address new markets and become a large company. The scale capital is primarily to scale our internal team in the areas of our exec team and engineering — we didn’t spend any money on marketing. In the early stages my co-founder and I were playing all of the executive roles ourselves. This won’t scale as we scale to a larger business and take on more verticals. Right now we are in stationary, wall art, fabrics, home decor, and experimenting with a few other verticals. Reid Hoffman: Can you unpack a bit about the move to verticals — how did you know the correct time to do a multiple vertical strategy? When we decided to move into art, we experimented with one design challenge. Could the community provide art which would successfully sell? Everything on the supply chain was the same for stationery (Minted produces all of their products) — but could the community choose things which people wanted to put on their walls? The results of our first experiment worked. We knew it really worked when West Elm wanted our art in all of their stores. It’s always a good sign when the people in the know want your contact. We very much look at Minted as a content company — we make content — we just sell it in a physical form. It’s much harder to have good indicators when you are just starting and your traffic is very small. It’s tough to know if anything is working or not. Reid Hoffman: Let’s zoom into the first month, how did you know things were working or not with limited data? Mariam Naficy: In the first month of Minited we had zero sales, this was very different from Eve — when as soon as we got the store up, people were buying. Within the first 6 months of Minted we only had one transaction. The interesting realization is we had all of this branded inventory (from our brand partners) and 22 designs which were crowdsourced — specifically “save the date” cards — and these were the items that were selling. We went from one sale a week, to two sales a week, then to 3 sales a week. We couldn’t tell if this was good or bad but we saw a very tiny sign of life in our crowdsourced products. At the time I was thinking to take all of the money we had raised (which was largely through my friends) and give it back to our investors because I didn’t want to continue on something which wasn’t working. Honestly the only reason why I kept going was I felt the responsibility over my friends money and I wanted to make it work. This is the reason why we took our first small venture capital round — in 2008 — so the company would have enough capital to make it through this period. I had also lucked out again because a couple weeks after we raised this money, Lehman Brothers had announced bankruptcy. Mariam Naficy: One of my angels called me and said he had a bad feeling and we should raise money asap. I was on vacation at the time and came back home immediately and raised money from IDG, then 2 weeks after that Lehman Brothers made their announcement. Reid Hoffman: During Paypal we had raised $100M in 2000, and we closed this round on the day the NASDAQ peaked. This was really to Peter Thiel’s genius — at the time there was so much interest, international investors were literally wiring money to our bank account and asking us “if they could invest” — this is how crazy it was. I was amongst the people telling Peter that if we had this much interest we should raise more money. Peter thought this was a sign the times were too crazy and raised as much as he could ASAP. Another time in 2008 David Sze of Greylock Partners (who was on the board of LinkedIn before Reid joined Greylock) said the markets were unstable. He wasn’t sure what was going on but knew things were overheated and suggested to do an investment round as insurance. At LinkedIn we did our whole Series-D round just for insurance which ended up a good time to do it. One strategy as you scale is to do this kind of capital planning and be able to raise money even though you don’t need it at the time. This is also a big value add a VC firm can provide. Reid Hoffman: Did the idea for doing a crowdsourcing come from the beginning of Minted, or did you learn that over time? Mariam Naficy: Personally I always wanted to do crowdsourcing, but my investors wanted me to do branded merchandise. We are lucky we experimented with crowdsourcing because that is what saved the company. When we knew crowdsourcing was working we needed to wind down all of our brand relationships. After 7 months of trying to convince them to join our platform pre-launch we had to tell them that: we couldn’t sell your products and we are now going to compete directly against you. I felt really bad about having to do this but one of the benefits of having brands early on is they created the aspiration for our crowdsourced designers to compete in our competitions. People wanted to have their products selling next to the big brands products. Reid Hoffman: How did you think about the community of Minted? Mariam Naficy: For our community we always had smart, consistent, and fair policies. We stayed true to all of our policies, we didn’t go back on our designers, and we kept very consistent communication. Community can be a great leverage point for a company. In our case our entire product design division of Minted is our community. It’s quite amazing what a community can do. Reid Hoffman: What did you learn from the building of this community network? What would you double down on? Any things you would do differently? Mariam Naficy: On the positive side, we moved very slowly with our community and this was the right thing to do. One thing we noticed while looking at eBay is you can never reduce commissions to your partners, it's much better to start conservative and to go slowly. We also strongly emphasize and believe in fairness because there is a strong word of mouth component amongst designers. One mistake we did make is when we implemented commissions we would celebrate the designer who made the most commissions in our community. We followed the model of Mary Kay where we would get our top seller on the stage by promoting the person who made the most to the whole community. When we did this, we had a huge negative reaction and people started quitting the community. People felt they couldn’t be as good, or couldn’t make as much money, or they didn’t want to be involved for monetary reasons. One book I read which was helpful on this is Drive — money can really take the energy out of a community, money isn’t the only motivator. We moved the motivator to be a focus on learning and growth through critiquing each other's designers. We don’t talk about money very often anymore, we only talk about things in the community to things we can live up to — get critique, education, and make friends through the design process. A second thing we observed is our communities — and people in general — want to know they are making progress in life. Progress can come in many forms: being included in the product catalog, being featured, getting a phone call from the Minted team, etc. Reid Hoffman: Did the community just grow on its own? Or did you have to do anything specific to grow the community? Mariam Naficy: In the very early days, we went to one trade show and emailed the attendees to participate in our design competition. Once we did that, we had way too many entrants to the competition. Minted is a curated marketplace — we only sell what gets voted to the top, so we had to be careful about adding too many designers too quickly. Another thing we found out is all of our consumer marketing (for the buyers not designers) attracted a lot of our designers. We didn’t intend for this to happen but it was an interesting thing to learn. One more observation is the definition of “who is creative” is changing. Many of our top selling products weren’t being designed by the professionally trained designers, but rather the self taught designers. There is one plumber in NYC who enters Minted competition and wins against people with art degrees. What is happening is just the tip of the iceberg for creative talent. Many people are told not to go into creative careers but there is so much design talent locked away inside normal people. People are now finally starting to express themselves on platforms like Minted. Reid Hoffman: So you just hit the oil well on the community, you never did anything else? Mariam Naficy: Designers largely told each other about Minted and our consumer marketing attracted the rest of the designers. When we released the new art vertical we approached a few artists in the beginning to submit their work. We recruited ~30–50 people initially but once the West Elm deal was solidified, all of the rest of the designers came on their own. These sorts of brand partnerships bring a huge amount of credibility, people wanted to submit. Reid Hoffman: Let’s move on to scaling the organization — what have been the lessons here around hiring execs, the differences between Eve, what has worked, what are you trying? Mariam Naficy: One thing I have seen is if we are around for long enough, people can grow within the company, but you need years to do this. This is how you develop your strongest and most unique leaders within the company. Reid Hoffman: How did you help the inside people scale as execs? What has helped? Mariam Naficy: In the beginning when we had very little capital, it was very difficult to let people fail because we were so close to our bottom line. Once we had more capital we could let people fail and grow on their own. For the first 7 years, we were always running out of money and we couldn’t make many mistakes. In this period my co-founder and I had to do too much micro-management. Reid Hoffman: This is a very classic pattern, using your network to help people within your team grow by going out and finding experts within particular areas. Moving towards not just the CEO delivering all of the news, but helping the team to manage each other. Reid Hoffman: Switching to your role as the CEO — how has your role changed? How do you triage the fires that are burning and what you need to work on? Mariam Naficy: In the beginning I needed to know every single thing that was going on at all times. Now I don’t know everything that is going on, it’s tough. Reid Hoffman: You strike me as as numbers person, did you create your metrics dashboards early? Mariam Naficy: Yes and I created them all from scratch. I love building dashboards, it’s one of my favorite things to do. I now use dashboards as a way of teaching people analytics. I’ll help our team members create reports and think about what metrics are important, it’s a key way of leveraging myself. Reid Hoffman: This is another classic scaling technique, to create metrics and dashboards to help guide the management of the company. There are dangers though — too many metrics, the wrong metrics, the wrong dashboards — which can cause dysfunctions within the team. Any thoughts on metrics as you scale? Mariam Naficy: We worked hard on creating real consistent questions from the beginning, then we tracked these same metrics over the entire life of the company. One of these metrics is our NPS score which we tracked from our first sale. Analytics is one of the key areas I can not let go of, and also talking to customers directly (primary feedback vs. secondary feedback). I am also a big fan of using Survey Monkey to ask questions to our customers, and using the input to inform our products. Reid Hoffman: What is one example on how you used survey data to influence product? Mariam Naficy: One of the big pain points for customer sending out cards, is having to fill out the address on the cards. We asked “if we were to solve one problem in the card creating process, what would it be?” and writing addresses was the #1 pain. We looked into this problem and asked deeper and deeper questions and from this created an — upload your address book — feature which automatically addresses the envelopes for you. The real strategy is to create massive stickiness within our product. Reid Hoffman: With your initial stationary contests you ran, what would you change or do differently? Mariam Naficy: I would have liked to build out more of the product sooner. We were way too conservative in the beginning. I was worried about not having control over the outcome of the company and being forced down a path I didn’t want to go down. The result is we underfunded too much in the team and product. Question from the audience: What should one consider when evaluating a market to create a marketplace in? Mariam Naficy: For marketplaces I look for a market that could benefit from diversity — the long tail of demand — where diversity of products would make a different. I also look for a large base of people who can be suppliers. If there were very few artisans in the market, it would be harder to have enough of a supply for products. Question from the audience: How have you seen conservation of gender diversity shift? Any advice for for women entrepreneurs? Mariam Naficy: For women entrepreneurs, start as early as possible. I think women should take more risks then men early on because the time window is shorter (if you want kids). Secondly, female mentors are important but not the only thing. Make sure you also have male mentors as well. In terms of the diversity conversation, things have shifted a lot and times are changing. VC firms who never funded female entrepreneurs now have a couple female led companies in their portfolio. My general thoughts is the #1 thing to do is focus on results and company building, the rest will follow. Investors want to make money, if you can provide results — people will go to where the money is. Will post the next class notes here once they are done. Next speaker should be interesting.